>Road test: 2008 smart fortwo. The original smart car was met with both admiration and skepticism. Some called it too expensive, some called it ugly and some thought it was the best thing to hit the streets of big European cities. The smart ended up being a hit, enough so that they wanted to create a brand around it. The little two seater was rebaptized the fortwo while the roadster and the forfour (that seats five) made their appearances in showrooms, all under the smart moniker. The roadster and the forfour were phased out fairly quickly, a real shame when you consider the driving pleasure the roadster has to offer. The lisence to build it was sold to Chinese-owned MG. This left the little fortwo. At one point, whether or not it would be replaced was up in the air, there was talk of killing the smart brand. They decided to keep it around and redesigned it. This car is a huge hit in big cities and as of now, the smart has no direct competitor, surely that was a big incentive in keeping it around. It’s worth noting that Toyota has a smart rival in the works, one they call the IQ, not a horribly original name.. Previously, smarts were sold in Canada but not in the U.S. due to the myriad of regulations the EPA imposes on cars. This new model was designed with those regulations in mind and it was ready to take on the U.S. market. I hopped in my 300D and trekked out to Mercedes-Benz of Lindon. I found a showroom with no sales people. I went up front and asked for assistance, they sent a guy over who directed me to the “smart lady, she’s really smart.” Nice pun. I eventually got behind the wheel of a 2008 smart fortwo passion coupe (I guess the smart brand doesn’t like capital letters), a midrange model with a base price of $13,590. Add the blue paint, a “premium” radio, a clock, an tachometer and the destination charge and you’re up to $14,730. A rather hefty sum for this type of car but is it worth it? Well, it all depends on what you actually plan on doing with the smart. I knew what to expect, I’ve driven several smarts in Europe. The ignition is in the center like a Saab 900. The brake pedal is round and floor mounted like a Citroen DS. The engine is rear mounted like a Fiat 600 (albeit it’s transversal in the smart) and the radiator is up front like the Abarth version of the 600. The wheels are held on by three lugs like so many French cars of yesteryear. This car is French, in a way– final assembly takes place there. The engine is a three cylinder, one litre unit. It’s actually pretty peppy for what it is. It’s very nimble to drive, as one might expect. The steering wheel is minuscule, especially coming from a 300D, the turning radius is great and it’s very maneuverable. In a nutshell, it’s everything you would expect a small car to be. It’s actually surprisingly roomy inside. Two adults and their groceries/dog/or something of the like can fit comfortably, leg room is more than adequate. The materials used are a wee bit on the cheap side but that’s forgiven by the economy aspect of it. In Europe, some models don’t come with a standard glove box, just with door-less storage area on the dash, I’m not sure if it’s the same way here but this one had a glovebox. There is one big flaw that try as I may, I can’t get over: their “automated manual” transmission. I knew I was in for trouble when the saleswoman felt the need to explain to me how to shift what is essentially an automatic transmission. “When you feel the car about to shift, release the gas a little.” Heeey.. I used to do that in my 1979 300D. Shifting her way takes some getting used to. You don’t quite know when it’s about to shift so you lift off the gas too early, the car doesn’t shift, you start losing speed, push the gas again and right when you do, it shifts with a mighty jerk– another common trait with a 300D and a particularly annoying way to accelerate. When the stars allign and you get the timing right, it shifts smoothly. If you ignore the saleswoman’s instructions, the car takes off a little faster but the engine revs quite high and shifts late, I don’t imagine that’s overly good for the drivetrain, especially not since the car is only under warranty for 2 years or 24,000 miles, a low amount for the price and for a Mercedes product. It’ll be interesting to see how well these transmissions provide power to the rear wheels with 150,000 miles on them. Then you’ve got a third way to shift: when you’re in drive, move the gear lever to the left and you can shift it manually by moving the lever up or down. Alternatively, you can pretend you’re Michael Schumacher and use the little paddles behind the steering wheel. Whether you use the paddles or the gear lever, the end result is the same: lift off the gas, change gears, wait and it eventually kicks into the gear you’re trying to get into. Not a very enchanting way to drive. It’s a bit interesting on the freeway. With such a small wheelbase, it’s very twitchy. Due to the dimensions of it, may some higher force help you out if you’re caught in a crosswind or if you get passed by a lifted Dodge Ram pulling a trailer at 85mph, an all too common sight in this part of Utah. It will, however, get up to highway speeds and maintain them fairly steadily. But all that aside, it gets great gas mileage, doesn’t it? Sadly– not really. Smart has no plans to bring the diesel powerplant here so it’s only available with the aforementioned gasoline engine. The EPA estimates an average of 33 city and 41 highway. That’s roughly the same as a Jetta TDI (base price of $21,990.) Don’t get me wrong, 33/41 is respectable but I would have expected more from car with less engine displacement than a 1962 Volkswagen Type 1. The window sticker proudly brags “super creative parking solutions.” That’s true to an extent. 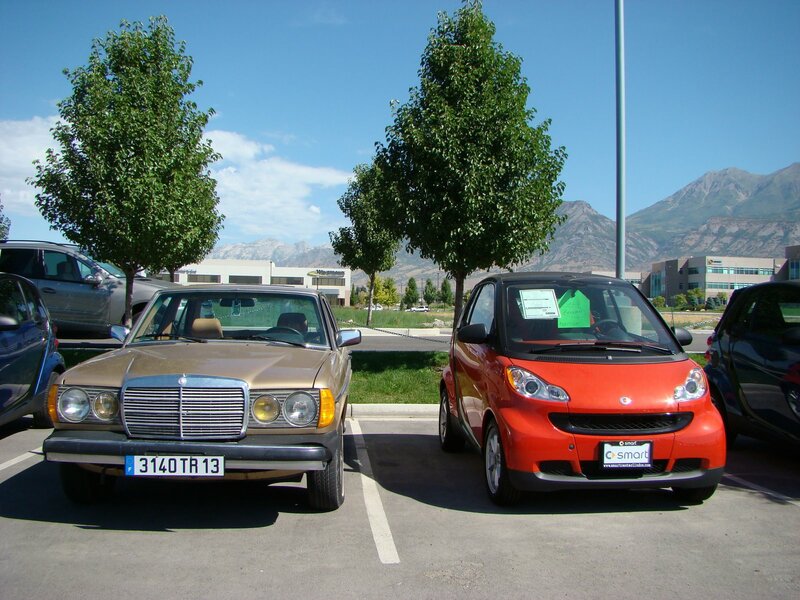 While a curb, a median or a roundabout are all perfectly acceptable parking spots in southern France or Italy, I think the Salt Lake City Police Department would frown upon seeing a Fortwo parked on a sidewalk and you’d have to get “super creative” when trying to explain why your car was parked there while trying to get it out of impound. But, no matter, you love the smart and must have one. You go (probably a very long way) down to your local smart dealer with a briefcase full of cash, pay, sign and drive off in your new smart. Or at least you would in Europe. The process in the U.S. is incredibly complicated for what it is: you log on to http://www.smartusa.com/. You pay a $99 reservation fee. They assign you a smart dealer and you order your car through them. The waiting list for one of these is two years. Yes, two years! You’d order it now and get it in the fall of 2010. I suppose that the bright side to it is that if you already own one, that colossal waiting list is sure to keep used smart prices up. Driving this thing is a love it or hate it deal. If you can get used to it, this is an original little car to run errands in, to do city driving or as a nifty second car. If you regularly go on the freeway, I would opt for something else. If you plan on starting a family in the next two years– pass. >This was a nice read! I enjoyed the getting “creative” explaining why it was parked on the sidewalk :). When I went to the dealer in Englewood, NJ, they had one parked on the sidewalk, and that was the one I got to test-drive. I’ve known about these for yeaaaars and was disappointed when they had mileage restrictors put in because of “EPA” measures, but I think it’s all political. The no diesel aspect also stinks, and you can’t buy one in Canada (not that they make them anymore) unless you have a Canadian driver’s license and Canadian insurance. Epic fail on all levels.Thanks for the post!